Special sensors are able to continuously monitor pipelines for leaks by listening to water flow vibration noise. The American Society of Civil Engineers estimates 6 billion gallons of treated drinking water are being lost daily through leaking pipes like this one. New acoustic technology devices show promise in detecting leaking buried pipes long before they break, saving valuable water supplies and avoiding major repair expenses. According to the 2005 Report Card for America's Infrastructure, prepared by the American Society of Civil Engineers, "Each day, 6 billion gallons of clean, treated drinking water disappears, mostly due to old, leaky pipes and mains ... enough water to serve the population of a state the size of California." Wayne Morgan, American Water's vice president for business performance for its Northeast region, offered the company's new acoustic solution to water loss problems at a September conference in Halifax, Nova Scotia. American Water provides services to more than 18 million people in 29 states and three Canadian provinces. "We set up a pilot program in Connellsville, Pa., equipping 500 water meters with an MLOG leak detecting sensor, manufactured by Flow Matrix, and an MR transmitter, all part of a fixed network system designed by Hexagram," Morgan said. The MLOG sensors, used during night hours when water system use is lowest, are able to detect even small leaks by acoustically listening to water flow vibration noise in pipes. A computer program interprets the noises, distinguishing between normal levels and sounds that indicate a possible leak. "In the Connellsville tests, over a three-month period, we were able to reduce leakage significantly, from losses around 25 percent to about 15 percent," Morgan said. "We're far enough along now to begin publicizing the system. We've made a proposal for installing it in Puerto Rico and we're marketing it to others (in the utility industry)." Connellsville was selected because its non-revenue water losses were found to be exceeding 25 percent of the water distribution system's total volume. During 2004, there were 35 main or service break repairs. With the cost of water purchased for the system at $1.90 per thousand gallons, and a distribution system that dates back to the 1800s, reducing leakage incidents is financially feasible in Connellsville, Morgan said. How cost-effective the American Water system will be for any particular distribution system will depend on whether a high-percentage of leaked water is already being lost, the size and age of the system, and the cost of the non-revenue water being lost. A rural system may need more sensors, which would add to the cost. Some pipes have poor acoustic properties and could require a higher concentration of sensors, which also would increase costs. In the first test of the Connellsville installation, with about 40 percent of the sensors installed, covering about 25 percent of the system, data showed 26 locations with a high-to-moderate probability of a leak. After examining the 11 most suspected sites, six leaks were found, including hydrant and service line leaks. Considering the extent of the nation's millions of miles of buried, aging water pipes  and the increasing scarcity of water supplies in many areas  detecting and stopping water losses has become an important issue, Morgan said. "Our goal is to promote water resource conservation with an affordable, around-the-clock means of detecting and repairing water leaks," he said. Morgan said many water utilities conduct manual surveys of their systems to look for leaks every three to five years. The MLOG system offers constant monitoring and reporting of even small problems before they become major ones, he said. Using automatic meter reading technology as part of the system can even provide a utility with daily information about the condition of its distribution network, Morgan added. Flow Matrix, a leak detection company, developed the MLOG devices as part of American Water's search for a low-cost leak detection system that could provide leak analysis on demand, Morgan said. An MLOG sensor strapped to a metal pipe can monitor sounds up to 500 feet away. That sensitivity means only a small portion of the pipe network, often as little as 10 percent, needs to be monitored by each unit, rather than having to install one-per-customer, which reduces the cost of the MLOG units to about $15 per customer connection. Originally, MLOGs were coupled with a radio transmitter that sent stored information to the walk-by meter reader as meters were checked for billing. Recently, American Water has been testing automatic meter-reading transmitters that provide drive-by data to passing utility vehicles. Also, data can be collected at stations on poles or buildings, then downloaded through cell phones or utility control centers where the information is analyzed. Although American Water is concentrating its tests of the system in the East where its customers are most concentrated, the Northwest will be a future market for the technology. "If there is interest in the Seattle area, we would be happy to meet with the appropriate people to discuss our system," Morgan said. American Water is the designer, builder and operator of Seattle Public Utilities' Tolt River Treatment Facility. Together with the Cedar River watershed, those two sources provide water to more than 1.3 million people in Seattle and King County. At Tacoma Water, special project engineer Joe Eltrich said the city utility regularly checks its water system, at least every five years, using outside acoustic survey firms that include the Seattle office of Hughes Supply. "We have a tight system with little water loss," Eltrich said. Tacoma Water delivers about 15 million gallons a day and loses much less than the 10 percent threshold that Eltrich calls a tight system. 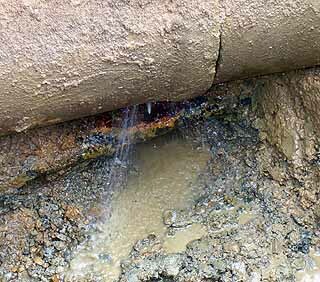 "A recent survey of 760 miles of mostly old cast-iron pipe and other materials that are more susceptible to leaking than our newer non-ductile pipes found about 10 leaks collectively losing roughly 450 gallons per minute," he said. "For perspective, a loss of about 694 gallons per minute would be 1 million gallons a day." Eltrich said it's common practice in the water industry to use acoustic signals to pick up the sound of water rushing through a leak or a partially open valve and then home in on the leak with computer software that isolates the leak location for repair. "Acoustic leak detection systems aren't new, but if American Water has a system that will provide continuous monitoring and gather data automatically and remotely, that would be something new. When it comes to monitoring water systems, the more meticulous you are the better your water savings will be," he said. Are you ready for a $30B quake?